WW1 Reenactments Equipment : Great War Tommy WW1 Documents, Paperwork : Booklet Cover - Notes on Trench Warfare. WW1 Reproductions and WW1 Reenactors Equipment / Kit - Booklet Cover - Notes on Trench Warfare. Booklet Cover - Notes on Trench Warfare. Buff booklet cover only. 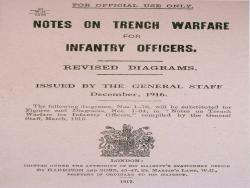 (7"x5" approx') "Notes on Trench Warfare for Infantry Officers". December 1916 with revised diagrams. Handy as a cover for an Officer's pocket book.